The Compression category features Actions that can compress files into popular archive formats, extract archives to specified location as well as retrieve essential information about contents of archive files. File compression greatly facilitates data organization and logistics. Freeware file compression actions allow storing multiple files and folders into a single archive file, both saving disk space and allowing for quicker file transfers. File compression and decompression actions often play an integral role in automated data processing. It is usually a good idea to compress a folder into one file before mailing it as an attachment. Or consider regular data data backups where compression allows to save space and strong archive encryption keeps data safe. 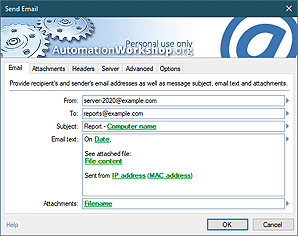 Conversely, Automation Workshop can unpack delivered archives automatically, and even email or print documents for you. Zip files can automatically compress files and folders into archives of various formats such as zip, tar, tar.gz, tar.bz2, gz and bz2. User can choose compression level balancing between compression time and archive size. Strong file encryption allows creating securely protected archives that are inaccessible without password. Compression tool fully supports Unicode filenames and can split archive into multiple volumes of any size, if necessary. Unzip files provides options for automatic archive extraction. During extraction the original folder structure is preserved, if not specified otherwise. The Action automatically detects archive encryption type and can extract password-protected archives if password is provided. Zip archive information analyzes the archive file and retrieves essential data on its parameters and contents. Multiple volume archives are supported. The Action returns such parameters as archive name, list of files in archive, number of files in archive, the archive size, the uncompressed size of files in archive, compression ratio and action completion status. Retrieving the data on archives can be usefully streamlined as part of file storage workflow. Zip files · automatically compress files and folders in popular archive formats. Unzip files · automatically extract files and folders from archives. Zip archive information · retrieve data on archive file parameters and contents. I've been wanting this functionality for years and you've implemented it perfectly. Nice job! —Robert M.